These aquatic plants are difficult to identify to species level because the leaf shape varies with water depth andflow rate. Some starworts are annuals and others are perennials. 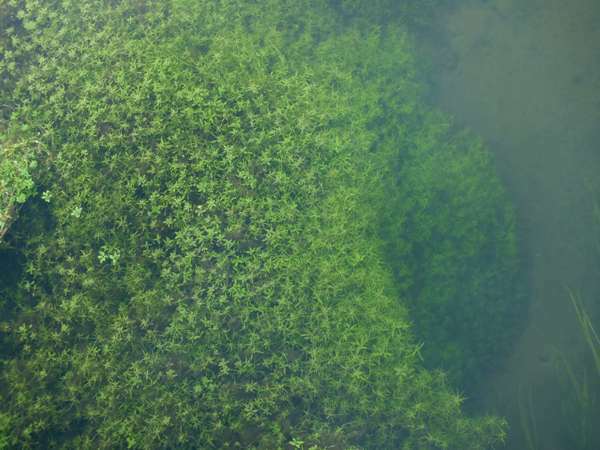 Common Water Starwort is illustrated here. In Wales, where this specimen was photographed, the River Teifi around Lampeter has several other startwort species including Callitriche hamulata, Intermediate Water Starwort. Callitriche stagnalis is widespread also throughout the rest of Britain and Ireland and occurs as a native plant in most parts of mainland Europe and in northern Africa. In North America Common Starwort is an introduced species, first discovered in the New York area in 1861, and is now a nuisance invasive weed in parts of the USA and Canada..
Starworts of various kinds occur mainly in shallow (depth to about a metre) static and slow- to moderately-fast-flowing water. Callitriche, the genus name, comes from the Greek words From the Greek kalli- meaning beautiful, and -thrix which means hair. Callitriche is therefore a reference to the hair-like stems of starwort plants. 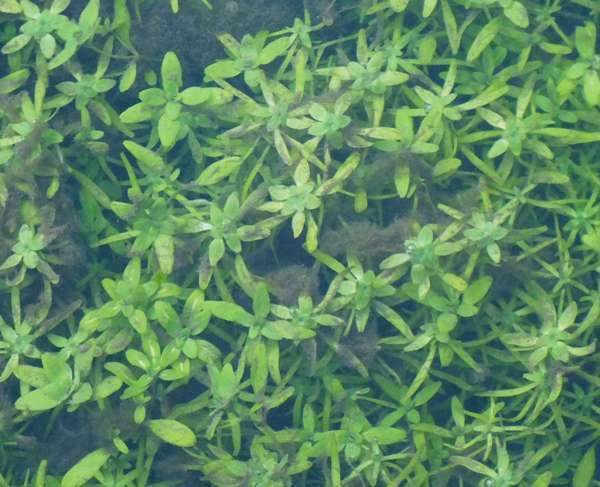 The specific epithet stagnalis is, as you might expect, a habitat reference: this species often occurs in stagnant (standing or stationary) water, although it is also probably the most common of the starworts that grow in slow-flowing streams and ditches in Britain and Ireland.